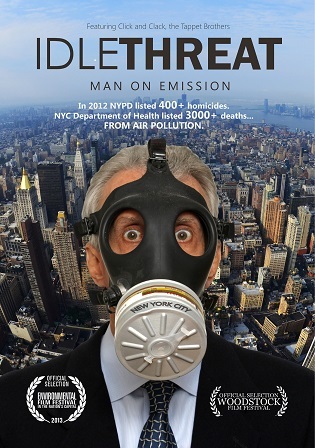 Idle Threat is a lively look at one man's spirited struggle to improve public health by raising awareness about idling's impact, starting in New York City.Against all odds, he succeeds, helping improve local air quality, and in the process gains world-wide recognition for the anti-idling cause. In a white shirt and tie, Wall Street banker George Pakenham has walked the streets of New York for over five years, courteously confronting over 3,000 motorists to explain the idling's impact and the law prohibiting running a parked vehicle for more than a short time. Responses vary from thanks to anger, but Pakenham never wavers. He's determined that the problems idling poses be recognized, and lobbies successfully for the city to enforce its idling laws. Featuring Click and Clack from NPR's Car Talk, and Mayor Michael Bloomberg, Idle Threat profiles one man's challenging quest to make his city and the world a healthier place, and shows that sometimes one person -- and a simple act like turning a key -- can make a difference. Highly recommended. An eye-opening documentary that draws attention to a common problem, and a solution, that few people even recognize. It also shows the link between individual actions and solving broader environmental and political problems such as energy dependence, environmental pollution, and public health challenges. Well-done and entertaining...."
"In an engaging and informative approach to a serious environmental issue,Idle Threat tells the story of effective citizen engagement and impact." "In the vein of Michael Moore's cinéma vérité, Pakenham becomes our man on the street accosting idlers who pollute the streets of NYC with their vehicles' exhaust. The film manages to make you realize the deadly dangers present at the same time it makes you laugh out loud." "An entertaining and informative ride that shows how citizens who care can make a difference."